Risk of Rain 2 surprise launched in early access last week. The game is a followup to Hopoo Games’ 2013 Risk of Rain, a 2D roguelike platformer. Though it makes some changes to the original formula, Risk of Rain 2 is less a sequel and more the original game remade in 3D. This is great. As in the first game, you choose from a handful of characters with different sets of abilities. The first available character, the Commando, has a dodge roll and a variety of ammo types. Other characters, who can be found in the world or unlocked by completing certain tasks, can freeze enemies, lay down turrets, teleport, or wield swords. Most of a character’s abilities are on cooldowns. You have to manage them carefully to take on the hordes of monsters that spawn as you spend more time in a level, as the game’s difficulty increases over time. Each level has a teleporter you need to find to progress; activating the teleporter spawns a boss. Later levels felt like a moshpit of floating fireballs, laser-shooting giants, and deadly flying jellyfish. Risk of Rain translates well to 3D, for the most part. Pixelated monsters that were kind of adorable in the 2D version are terrifying when their hulking forms materialize beside you in 3D. Items you find attach to your character, and it’s fun to see yourself studded with ukuleles, spectral knife arms, and floating guns. The worlds themselves have more presence than they did in 2D. An ice level feels barren and vast; a fire level, covered in jagged floating islands and bridge-sized chains, is oppressive and threatening. The level layouts aren’t as visually distinct from each other as they were in 2D. Layouts feel repetitive, with little variation from run to run. The landscape itself can be difficult to parse, especially when you’re looking for the teleporter, a flat circle with two claw-like pillars rising out of it. It was easy to spot in 2D once you came across it but can be maddening to find in 3D. In a few games, I realized I had passed and missed the teleporter multiple times because it blended into the landscape. Since the game’s difficulty increases over time, 10 minutes spent backtracking has a high penalty that can make things frustrating. The developer says it’s working on making the teleporter easier to see, so things that frustrate me during early access may change. 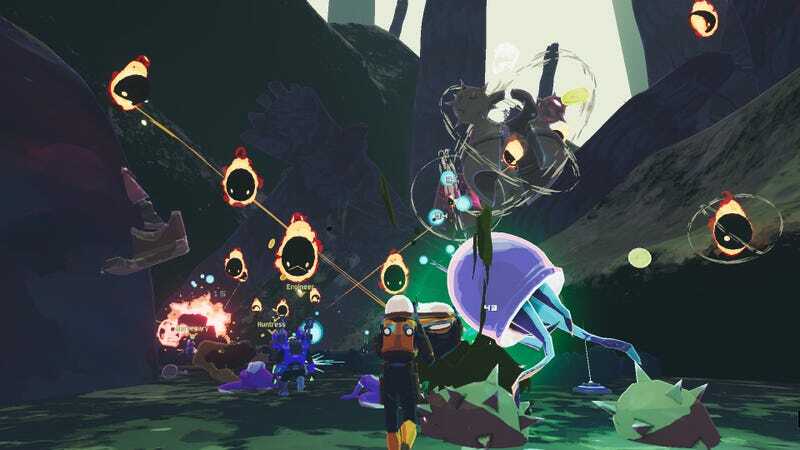 Risk of Rain 2 has new characters, items, and a rare persistent currency called Lunar Coins, which unlock special items and a character. The teleporter also functions differently. Now, it won’t fully charge and let you leave the level unless you’re within a certain radius. This design choice encouraged me to fight bosses where they spawned instead of applying my tactic in the first game of leading them to more strategic spots on the map, which made boss fights feel a little more dynamic. Overall, though, Risk of Rain 2 felt to me like more or less the same game with a new look. I have no problem with this. Risk of Rain is one of my favorite games to be terrible at, and it’s just as fun to try and fail in 3D as it is in 2D. I spent the weekend hopping between Risk of Rain 2 on my PC and Risk of Rain on my Switch, equally delighted and frustrated by both. I’ve yet to check out multiplayer or the daily challenges, but I look forward to doing so. As the game’s early access period continues, I’m hopeful the levels will get more distinct and we’ll see even more items and characters.